AMMONNEWS - President Donald Trump signed a decree on Monday at the start of a meeting with Israeli Prime Minister Benjamin Netanyahu saying the United States recognizes Israeli sovereignty over the Golan Heights, territory that Israel seized from Syria in the 1967 Middle East war. 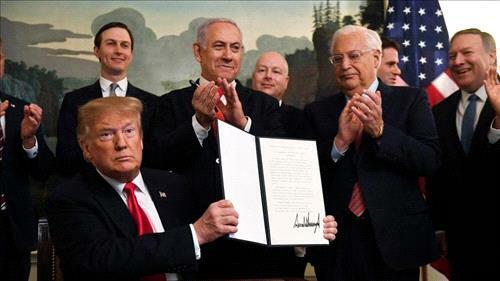 The decree formalized Trump's statement on March 21 saying it was time for the United States "to fully recognize" Israeli sovereignty over the Golan. The move appeared to give Netanyahu a boost ahead of the closely contested April 9 Israeli elections. Trump had previewed the move in a tweet last week that it was time for the US to take the step after 52 years of Israeli control of the strategic highlands on the border with Syria.